Breakfast is amazing! They have a lot of different foods to chose from. The hotel is beautiful with a private beach and pool. Although this property is a bit out of the way, that is also part of its charm. 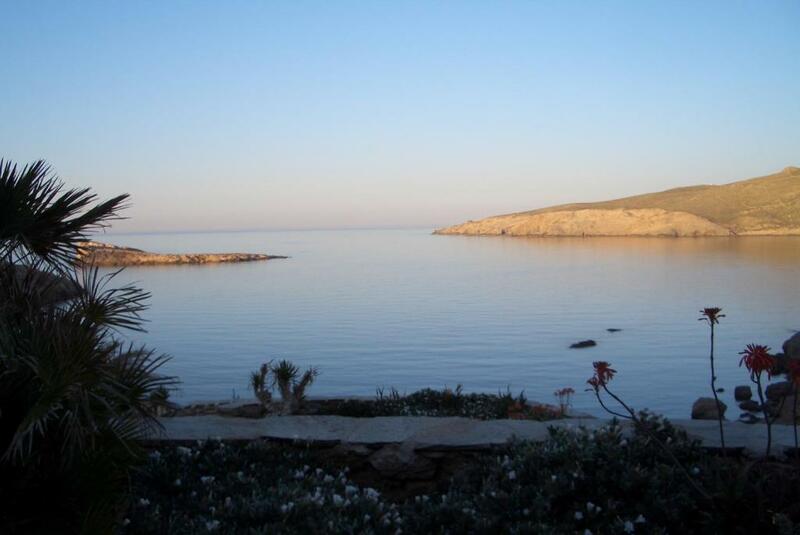 It is very quiet, and sits on a beautiful beach that is private to this hotel and one other. Serves a wonderful breakfast with lots to choose from. The internet in the room was very fast and reliable, much more so than other places we have stayed in Greece. The staff is wonderful and take good care of you, especially Stavros! The rooms were very spacious and spotless. The breakfast had great variety and it was nice to have a private beach just a couple of steps away. 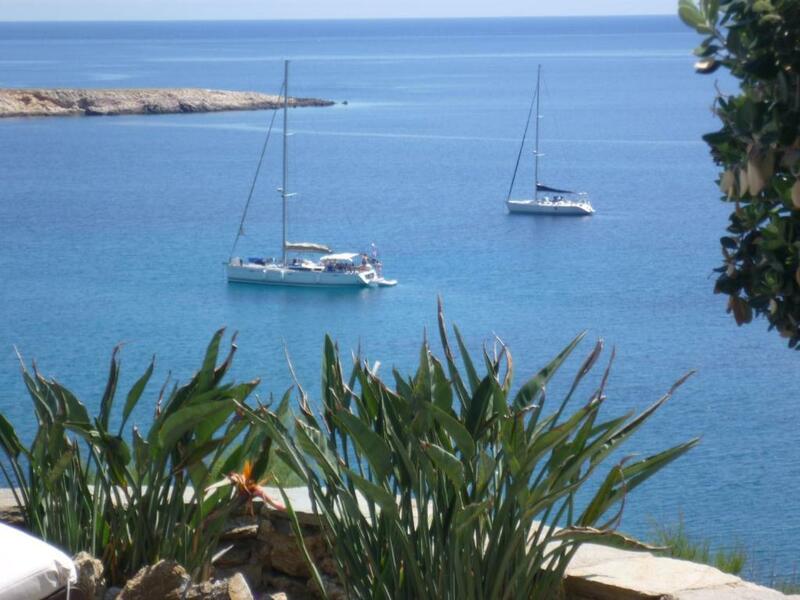 Fantastic service, excellent facility, beautiful beach with private access. All the little touch and details in the room are amazing and made us feels so welcome. The service and questions answered by Mrs. Venia and Stavrois were always extremely friendly and quick. Breakfast was the best we had on our 17 day trip. We would definately stay here again. It was so comforting and beautiful.... We didn't even want to leave the location. Everything!!!! Location. Room incredible view and very nice decoration!! Breakfast very good. The private beach excellent!!! Venia, the Manager, so so helpfull and kind before and during our stay . Free transfer from and to airport. Stavros went to fetch us, very kind too the same as all the staff. Definetly will return and super recommend!! Ideal location for us (we wanted to be away from the main town). Beautiful facilities. Great staff. Highly recommend. The room is big and well equipped. The beds are very comfortable and the breakfast very good. The beach just down the stairs is gorgeous, others are easily reachable even with a short walk. The staff is helpful and very friendly. A perfect hotel for a family with a small child. Lock in a great price for Mykonos Thea – rated 9.5 by recent guests! Mykonos Thea is a beachfront property located in a quiet location of the northern part of the island, right on a small, sandy beach, overlooking the bay of Panormos and Agios Sostis Beach. It offers a swimming pool and a stone-paved terrace with sun loungers. 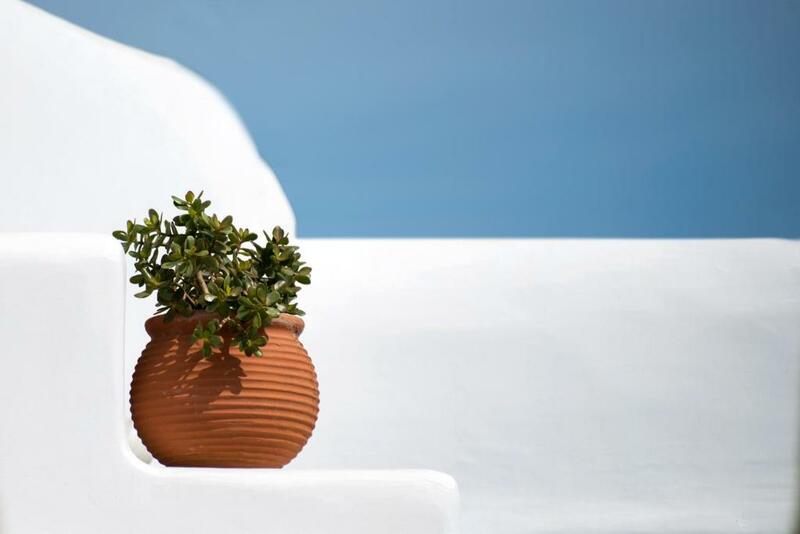 The studios and rooms at Mykonos Thea are comfortably furnished and equipped according to the traditional Cycladic architectural style. They are fully equipped with air conditioning, coffee making facilities, fridge, and satellite TV. 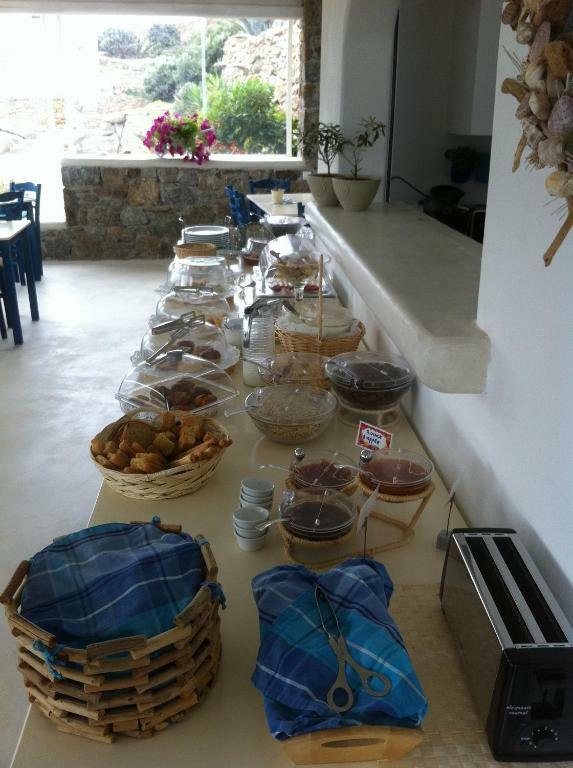 The breakfast veranda overlooks Panormos Bay, offering a buffet breakfast, with homemade specialties. The beach of Panormos is only 0.6 mi from the hotel and has bars and restaurants. The cosmopolitan Mykonos Town is less than a 10-minute drive away and Mykonos Airport is at a distance of 5 mi. 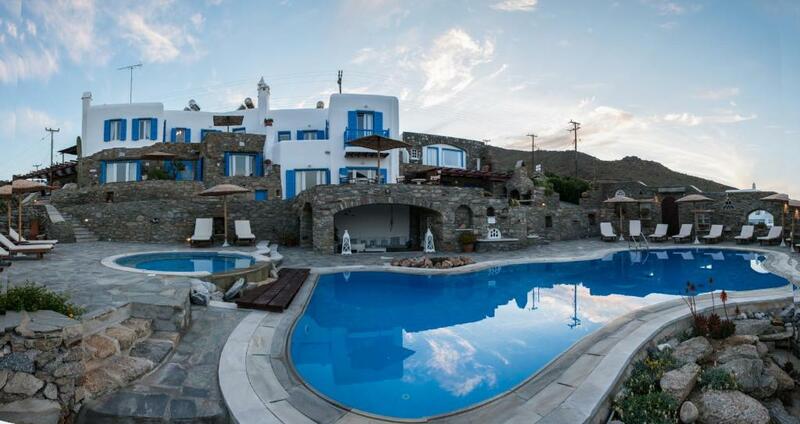 This property also has one of the top-rated locations in Agios Sostis Mykonos! Guests are happier about it compared to other properties in the area. This property is also rated for the best value in Agios Sostis Mykonos! Guests are getting more for their money when compared to other properties in this city. 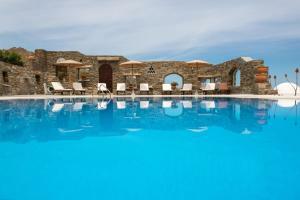 When would you like to stay at Mykonos Thea? Featuring a fully equipped kitchen and a seating area with fireplace, this air-conditioned, one-bedroom apartment offers Aegean Sea view. Free WiFi is included. Featuring a fully equipped kitchen and a spacious seating area, this air-conditioned, two-bedroom apartment offers direct Aegean Sea view. Free WiFi is included. Its two bathrooms are stocked with a shower. Featuring a kitchenette with cooking hobs and a seating area with a satellite TV, this air-conditioned studio offers Aegean Sea views. Free WiFi is included. 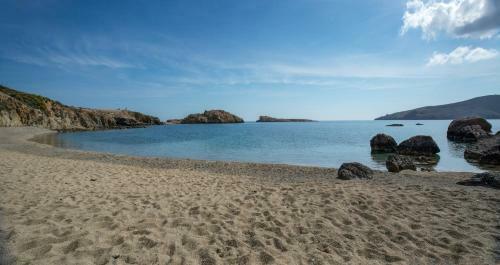 Our area, "Agios Sostis" area, is a country side location at the north part of the Island, 9 klm from the Town Chora. This place has not any shops, bars , or coffee shops, there are 3 restaurants in walking distance, only 1 of them stay open until 11:00 pm.We offer the most beautyful beaches of the Island, the most clean , and totaly natural. The place is ideal for persons who need relaxation, calmness and nature activities as running, walking, swimming, snoerling ! It is also ideal for families with small children..
House Rules Mykonos Thea takes special requests – add in the next step! Mykonos Thea accepts these cards and reserves the right to temporarily hold an amount prior to arrival. Please note that for guests staying a minimum of 2 nights, the property offers free transfer to the airport or port upon request. Transfer hours are from 08:00 to 21:00 (outside these hours, the transfer can be provided on request and at extra charge). Please inform Mykonos Thea of your expected arrival time in advance. Please inform Mykonos Thea of your expected arrival time in advance. You can use the Special Requests box when booking, or contact the property directly using the contact details in your confirmation. 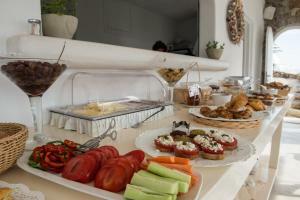 Limited amenities for food as only Mykonos star and kikis in walking distance. Although food at Mykonos star was good if not a little expensive (can recommend the squid) there was over a two hour wait to get into kikis even out of season. The Thea is Lovely restfull place though so still rated highly. The location. It was very far from town and supermarkets. We had 2 places to eat (the hotel only serves breakfast so lunch and dinner have to be at the 2 locations within walking distance). The restaurants are tasty but very expensive. This property is far from the main town, with only one choice for lunch or dinner at the hotel next door (which has excellent food). Having a car or scooter is necessary to see the island, but the hotel does provide free transfer to and from the airport/port. I liked the view the breakfast was very nice,the only thing is that it's far from the city and you need an international license to rent anything so make a note of it. Viviana was very helpful, its worth every penny. We went to paros 3 days later and compared to what we had in mykonos it was so poor. The hotel is in a remote location and it is not walking distance to any stores or to the city center. On our first night, we called the front desk at 9pm to order a taxi to the city center and the office manager told us that she could not help us as her office was closed. We tried to search for taxi companies and were offered rides for 50 euros each way which is incredibly high. As a result, we were stuck at the hotel for the night with nothing much to do. Due to this, I would highly recommend renting a car. The fridge in the room was a little bit noisy.